When using Excel there are a number of things you can do in order to store information. One of the best forms of information templates you can put together on Excel is a calendar. A calendar is a table of days, weeks and months over the course of the year. With this calendar you can keep better track of time as well as any significant events that may take place. Fortunately Excel allows you to store this information quite easily and efficiently. 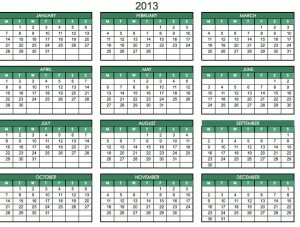 By using a calendar you will have a great way to keep track of important dates over the year of 2013. The first part of an Excel calendar template is the days and weeks. This is simply putting together a listing of the days and weeks of each month. By using this part of the template you will have the means to more easily know what day it is and therefore plan more easily for any significant things that may take place during this time. With the template for days and weeks you will have a very organized form of information to use during each day and week of the month. Another key part of a calendar template on Excel is dates and events. This is simply the days of the month that are quite significant. These may include holidays as well as vacations. With events you will be able to record special occasions that may occur such as meeting and also social gatherings. By using the Excel template for a calendar you will have a great way to keep very good track of the more important dates and events of the year for you. For those looking to have a very good source to use when keeping track of important functions then using the calendar to record dates and event is a great option to take advantage of.